A total of seven trophy wins in a range of categories, including Evelyn Chan as Young HR Talent of the Year, ensured Unilever Malaysia sealed the deal to take home the HR Grand Winner prize at the HR Excellence Awards 2017 held in Kuala Lumpur on 4 October. In bagging the final award of the night, Unilever Malaysia demonstrated mastery in categories such as Excellence in Employer Branding (gold); Excellence in Talent Management (silver); and Excellence in Workplace Wellbeing (gold). The awards were held at Aloft Kuala Lumpur Sentral, with Ramco Systems as gold sponsor, and attended by over 350 delegates representing the finalists announced earlier this year. Among the presenters were a host of eminent industry practitioners comprising the jury panel, who marked the entries received from more than 180 participants. Leading regional banker Maybank rounded off a successful evening, with the first trophy of the night (bronze for Excellence in HR Change Management), with Schneider Electric Malaysia and Shell HR Services Kuala Lumpur claiming the first silver and gold of the night, respectively. Maybank went on to claim victory in a number of other categories, such as silver for Excellence in Graduate Recruitment and Development (where CIMB Group bagged gold, and Unilever the bronze); gold for Excellence in Talent Management (where Unilever and Infineon Technologies staked their claim to silver and bronze respectively). In fact, the large regional banks proved their mettle as employers of excellence. 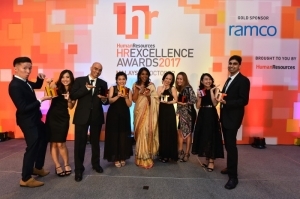 RHB Bank won gold for Excellence in Recruitment, where it was joined by SAP as the silver winner, and TMF Group with the bronze. Another big victor on the night was CIMB Group, safely tucking away two gold wins; the first for Excellence in Work-Life Balance (where Accendo HR Solutions and FOREFRONT International won silver and bronze respectively), and the second for Excellence in Learning & Development (where silver and bronze were attained by Citi Malaysia and Unilever Malaysia respectively). Complementing the ranked awards were the individual category awards, where the judges handpicked a single winner per category – starting with the SME Employer of the Year award presented to People Potential. Muhammad Rizal bin Md Zain, of DRB-HICOM bagged the HR Leader of the Year award, while Unilever Malaysia’s Evelyn Chan was picked as the Young HR Talent of the Year. Among a number of closely-contested categories was Excellence in Diversity & Inclusion, where Alcon MTO Johor took home the gold honours, joined by Merck, Sharp and Dohme Malaysia with the silver win, and Schneider Electric Malaysia clinching the bronze trophy. Similarly, competition was tough in the category for Excellence in Workplace Culture, where Mondel?z Malaysia inched ahead with the gold. CIMB Group and ViTrox Technologies snapped up the silver and bronze respectively. The team from Shell HR Services Kuala Lumpur had a successful night as well, with three big wins to its name, which included gold for Excellence in HR Innovation (silver to Maybank, bronze to SAP), and silver for Excellence in Employee Engagement, where British American Tobacco Malaysia took first prize, and bronze was snapped up by Arvato Systems Malaysia. Joining them was the team from Astro, which started with a bronze win for Excellence in Employer Branding, and capped that off with a silver for Excellence in Compensation & Benefits Strategy, where Arvato Systems Malaysia was the proud gold winner, while RM Leopad took the leap for a bronze victory. On the other end of the spectrum, gold winner for Excellence in CSR Strategy was CIMB Group, joined by podium winners Mah Sing Group (silver) and Zubedy (bronze). Other significant winners of the night included SunPower Malaysia Manufacturing (two silver wins), Prudential Assurance Malaysia and Johnson & Johnson (gold and bronze respectively for Excellence in Employee Healthcare); and First Solar Malaysia (bronze for Excellence in Workplace Wellbeing).